Frugal Cool began at the local primary school gate in the autumn of 2008. For a couple of years previously, creative neighbours and friends made fabulous jewellery, home accessories, bags - all small works of art and beautifully made. Most importantly, their work was made reusing textiles and trinkets. The simple idea behind Frugal Cool was to promote this creativity and craftsmanship ethically. Our tagline was Local Sustainable Design. It still is. 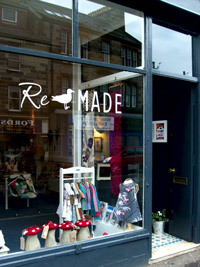 Most products we've sold online, at markets and in our ReMade shop in Musselburgh, have been made from something else. Something old and a bit tatty, discarded then found by us. New materials are natural, organic, recycled or fairly traded. We always question where things come from, and how they’re made. And we love vintage, and have focussed on mid-century modern style. Remade Home took place over four sunny days last June in Musselburgh's erstwhile secret glory, Loretto Gallery. 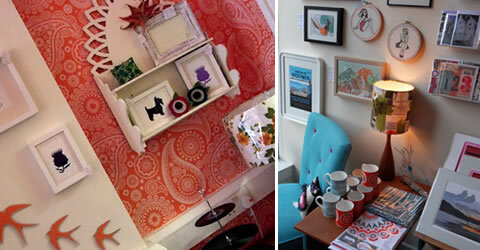 We mixed vintage treasures with contemporary eco design, remade accessories with upcycled furniture. 26 designers. 700 visitors. £3000 in sales. In 2013, we closed our ReMade shop after three great years to concentrate on developing our online presence, and to create new remade collections. Teaching creative reuse skills now plays are key role in our activities.